Oh, the friends i have there and that you can go to a party in nowhere to see the surprised look of them that someone from germany made it there. Oh, i was around 7 when i started on a K5120 with 2 diskdrives. It was mainly a CP/M machine. Much later i got a C64 for 9 Mega Drive Games. The Commodore Plus/4 and the Amstrad CPC. Oh there are some musics on the Spectrum, belonging to a demo. Or was it from a collection? It was from the UK, thats all i know and it was on Spectrum. Sometimes i find these tunes again. Otherwise, i liked the music from the PC demo "1995" and from the C64 demo "Animal 2" by full force. Which graphician, in and outside the demoscene, inspirated you the most? : Oh, i guess noone. You can see that on my style, its still crap. But for the rounder women, i like Brian's art and i even made some fanart about one of his characters. Its one of his favourites, which honored me. Uh...since there are not so many demos where pictures are important...i'd say some Demos where Diver/4D and Gas13 did the graphics. They were pretty cool. White Background, black lines. The Head first with hair, mouth/muzzle position and the rest of the body. For non-personal art, i make the looking spot first. 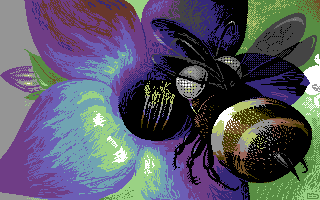 a cross between multibotticelli (+4), Interpaint (C64) and Art Studio+ (CPC). Botticelli has great control over the colours. Interpaint can use Amiga Mouse and Art Studio (OCP+) supports the CPC Plus. Oh...i have so many favorites...On Amiga Hardwired, on C64 i enjoyed various but cant make out a single one...on PC only a few old ones or some with good music....As for musicdisks, i liked the TIA music disks alot. And i read diskmags but dont like the idea of it. I take the Joke Demos. They should be the Party Winner! I think in older demos they coded everything from scratch. I liked the Mekka Symposium everytime. I would like to go to Assembly sometimes, or Euskal party. The scene went down on specific platforms like Amiga, ZX Spectrum and Atari. Now there are Demos for mainly the PC. But other Platforms became Popular, like the MSX, Plus/4, Vic20 and the Atari 2600. Its because they showed everything what could be done and these computers became boring. Except on PC. They reinvent themselves every day new. Oh, The Demoscene is just a nice thing to catch friends and have fun. It doesn have anything to do with my actual life. I have to Update. I use the Atari 8 bit now.